Olympic National Park has one of the coziest Lodges you will ever see. 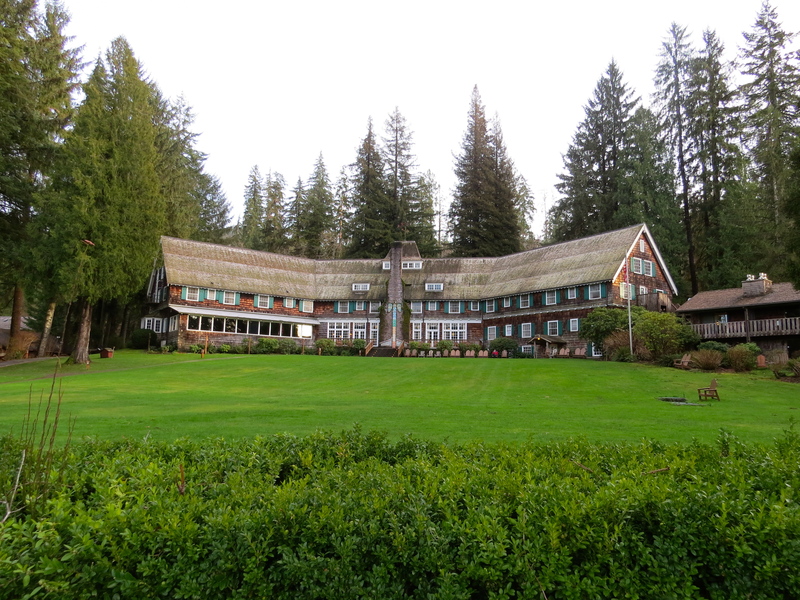 The Lake Quinault Lodge was built in 1926 at the Olympic National Park and sits on a slightly elevated perch overlooking a stately green lawn that runs down to the crystal water of Lake Quinault. 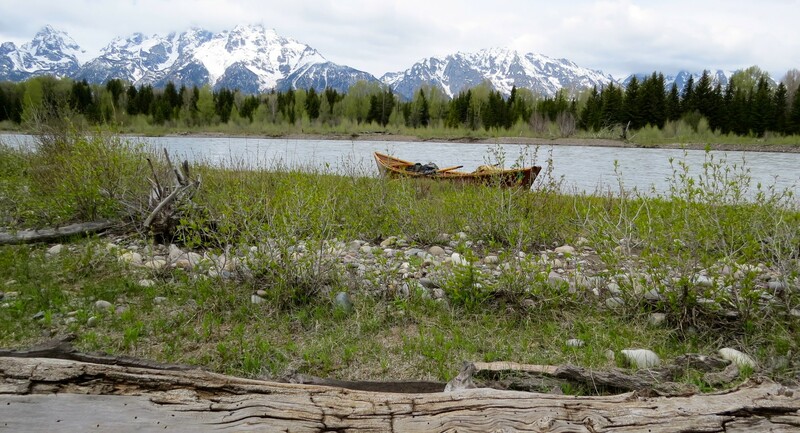 If this was any other “woodenboat adventure”, I would pull in to the parking lot, walk the grounds, admire the view, take some pictures, maybe have a sandwich in the lodge, and then go find a spot by the river for my tent and cot. 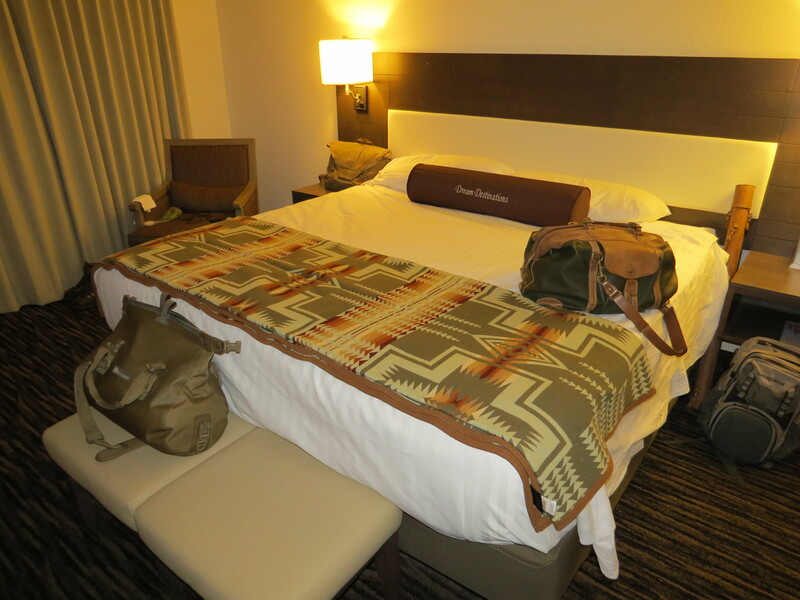 On this National Park adventure, however, I checked out the Lodge, and then I “checked in”…. that’s right – I signed my name, gave them my credit card, and got a key to a room with a roof, indoor plumbing, and a soft bed with clean sheets. It was elegant really and I felt very out-of-place… like they must have given me the key to the wrong room. 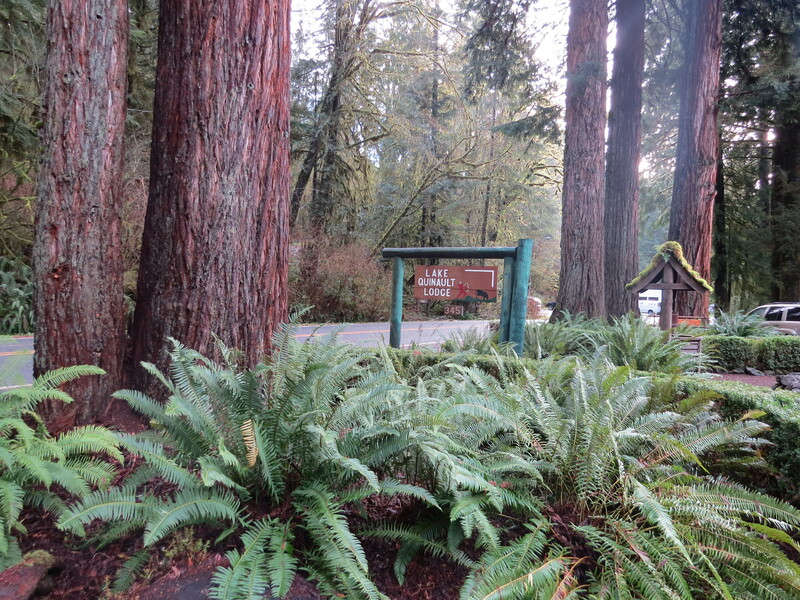 Since most of the camping area’s in Olympic are closed during the wet winter months, I decided early in the planning stages that it might be a good time to make an exception to my camping rule and stay at the Lodge… or maybe I was just “rationalizing”. Staying indoors kinda violates our “code of the river rats” and I am prepared to suffer the campfire ribbing on our next big trip where I will surely be reminded “there is no such thing as bad weather….. just bad gear and bad planning”… to which, I will counter with “I had great gear, put together a great plan, and stayed at a historic and very dry Park Lodge”. I will be heckled with great enthusiasm. 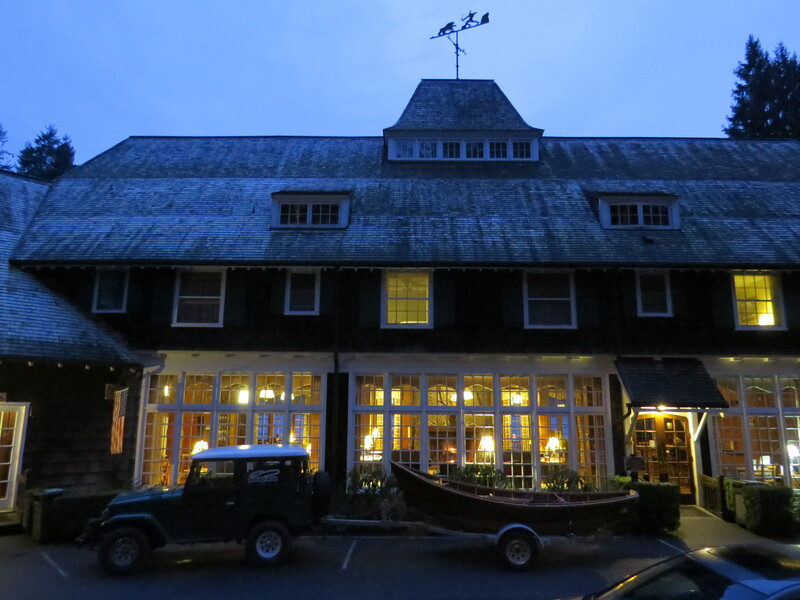 Before I got to the lodge in the late afternoon, I had to drive the two lane highway in a wicked rainstorm and high winds which made for slow going in my Toyota FJ40. Pulling a wood drift boat didn’t make it any easier as it fish-tailed in the grooves of the road, swayed with every gust of wind and slowed me down that much more. My fishing companions got tired of waiting for the rain to stop and for me to arrive so they went upriver from the Lodge for an afternoon float a few hours before I arrived. 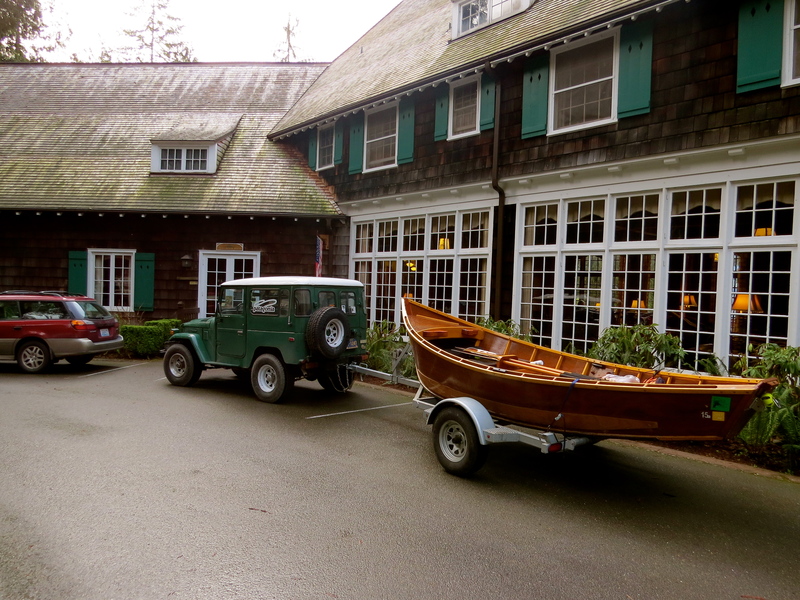 The parking lot was almost empty at the Quinault Lodge when I pulled in and the intensity of the rain picked up. Joining me on this National Park adventure were Rick and Rich LeBlanc from the Portland area – father-son. 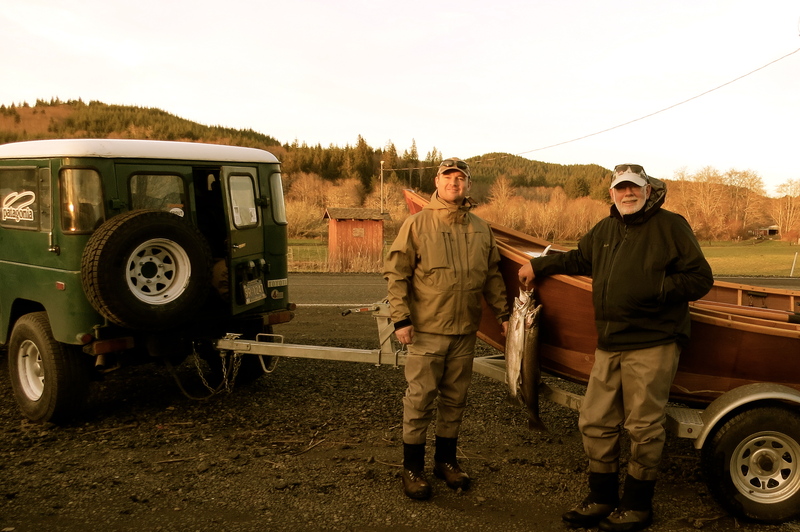 Rick and I are old friends and long time fishing companions. 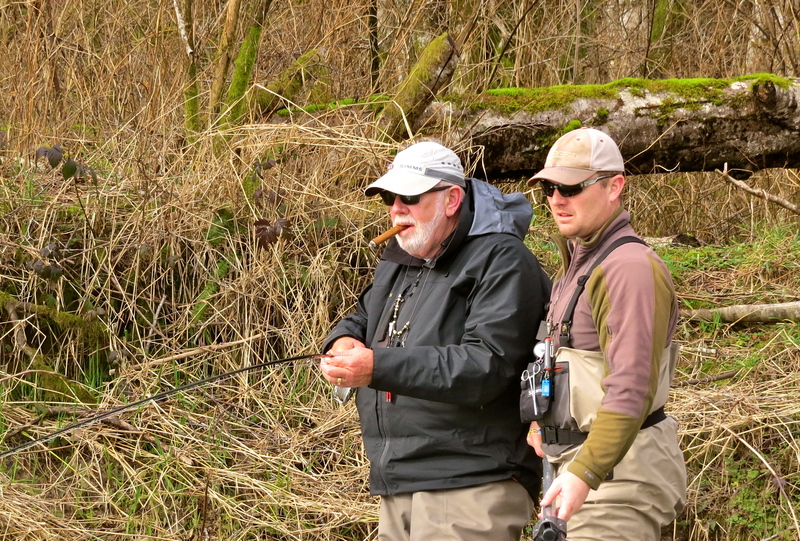 Our mutual obsession with chasing steelhead on flies led us to each other & many fine adventures. I was looking forward to seeing if Rich had the same passion for fishing as his dad. I caught up with them after their fishless afternoon and both were as soaked as two fishermen can be. We agreed to dry off and meet for dinner in half an hour. Just as they went to their rooms the entire Lodge went “dark”. No power – anywhere. A huge tree was the victim of high winds and knocked out power lines on the way to the ground. I talked to the site manager who told me they once lost power for two weeks – “no telling how long it will take to repair the lines”. I made my way to my smartly appointed room in the “west wing” and opened the door. The only light in the room was coming from the gas fireplace, giving the room a warm glow. 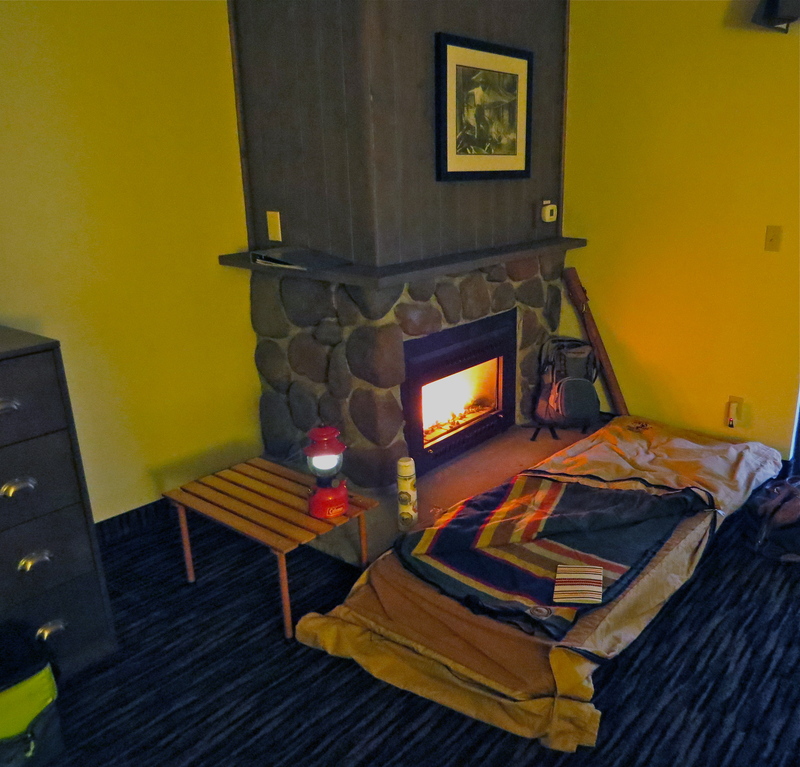 If you used your imagination and could look past the king bed, throw pillows, indoor toilet and carpet – it sort of resembled a campfire scene – which inspired me to set up my Therm-a-Rest cot and Pendleton bedroll next to the fire in case power wasn’t restored til morning. My friends will call it “glamping” and I will be heckled all the more. I walked from my dark outbuilding to the “lit up” lodge where the backup generator provided power and met the boys for dinner. Over dinner I heard details of their afternoon and it gave me “chills”. 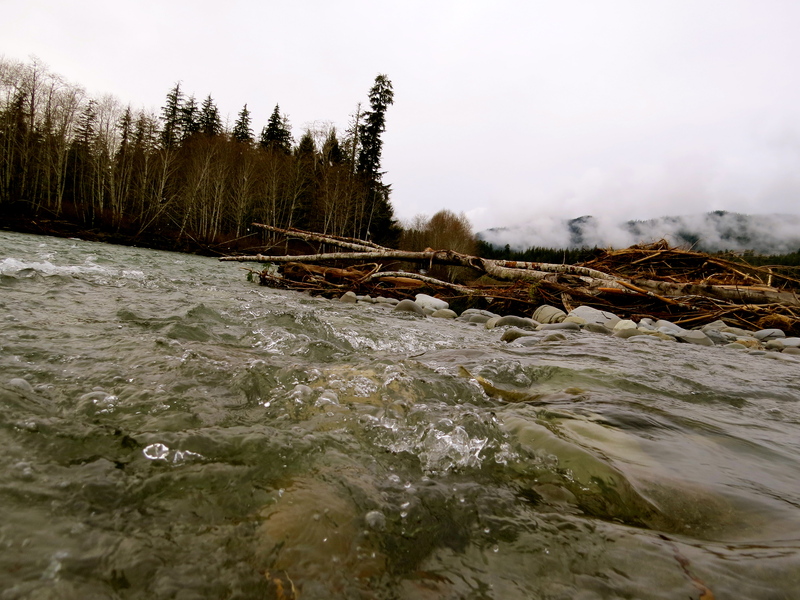 The heavy rains of winter and the high winds of the past two days had caused many large and small trees to go crashing into the river creating a mine field of log jams and “strainers”. A strainer is a pile of downed trees that collects on river bends, bridge pilings, shallow places in the river & creates a treacherous obstacle for boaters. The river still flows “through” a strainer and drags everything in the current with it – popping rubber rafts, flipping drift boats, sinking kayaks, knocking fishermen from their boats. Late in the afternoon they had tangled with one and it almost brought their boat down. The hair on the back of my neck stood up and I remembered again the river tragedy I can’t forget. His name was Warren Moran and the first time I met him was on the Deschutes River in central Oregon. I was in the boat of my good friend Rick Allen who was rowing and in the late, mid, early afternoon, I popped the cork on a 12 year bottle of Macallan and took a deep, satisfying pull. Out of nowhere, Warren, with his big Texas grin came rowing up beside us and said he detected the presence of scotch on the river…. after complimenting his sense of smell and his ability to row half a mile in 45 seconds, I handed him the bottle and we became instant river friends – bound by fish, flies, and scotch. 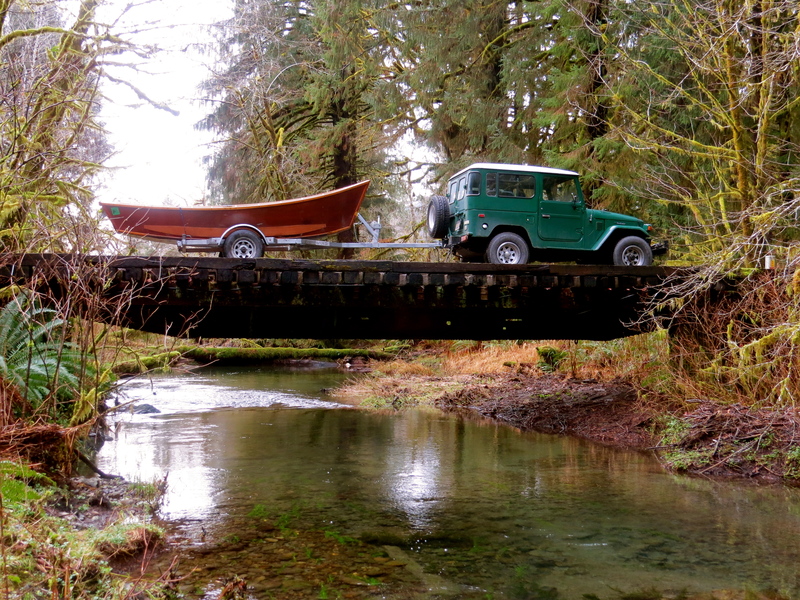 Just a few years later, Warren was out on the McKenzie River on a spring float with two friends in his drift boat. They were approaching a “strainer” at a sharp turn in the river, got a bit too close to danger and were pulled into the middle of the log jam. The branches stopped their forward progress but the river kept pushing the boat, forcing one side up while the other side dipped. Water came pouring over the compromised side and the boat flipped instantly. The river kept pushing and even though the boat wouldn’t fit through the tangled broken limbs, the river continued to push like a pile driver and took all three fishermen with it – trapping them under the trees and under the water. Warren never made it out. The other two fishing friends washed out several hundred yards downriver – alive but not without serious injuries. Early the next morning a couple of us went upriver to retrieve the boat and Warren’s things. Strainers make me nervous, and anxious and wary. 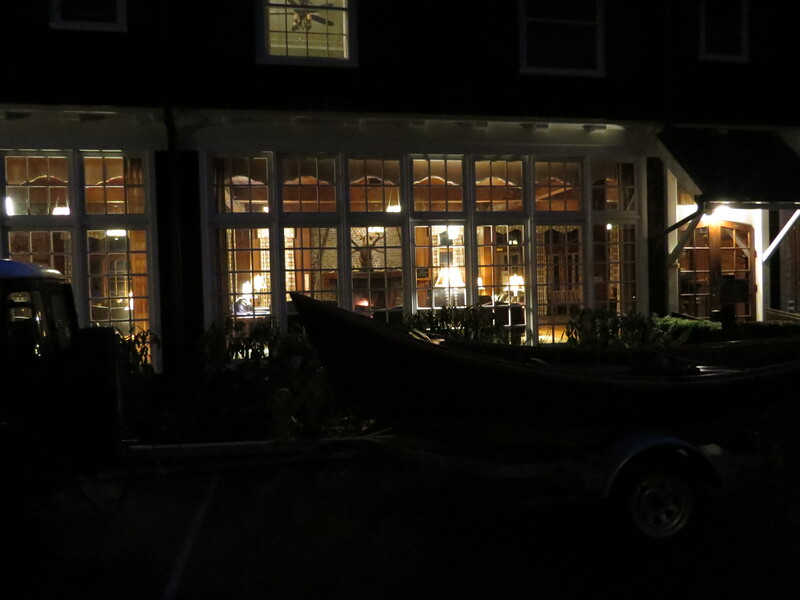 After our meal in the rustic Roosevelt Dining Room, I made my way from the well-lit Great Room of the Lodge to the still darkened wing where I was staying. The fire in my room burned warm and I was content in my Pendleton blanket and bedroll. Sometime during the night the electricity was restored but I slept through it. There was frost on the roof of the Lodge early the next morning and we drove upriver several miles higher than the LeBlancs had launched the day before. When the rainless dawn finally exposed the river, I could see very well what my companions had faced the day before and a familiar ache retuned to my stomach. There were downed trees everywhere in the river – many with their bows still green and “alive”. For the first mile it was a gauntlet and I was more concerned about rowing than fishing. Finally, the river opened up a bit and the main channel became more defined. Even so – every time we approached a “strainer”, I was edgy and focused and all business. When I could look past the treacherous obstacles of the river I saw such beauty on the Upper Quinault, I will never forget it. Sharp steep dark green mountains with wispy clouds seemed more like smoke from a chimney than any clouds I had ever seen. There were waterfalls around every turn – some were mere trickles and others “gushed” from the mountain sides. We saw elk and eagle and mink and river otters – all signs of a healthy vibrant river wilderness. The forest ferns provided even more shades of green to the landscape and it was breathtaking. Rich the son managed to catch two steelhead and Rick and I both missed a few chances – it was more activity than we expected considering the heavy rain and the condition of the river. We had a great day, stayed relatively dry, enjoyed fishing together, and only had a few brushes with log jams on the river. Burgers and beer in the Roosevelt Room that night tasted good and we enjoyed some time by the walk-in fireplace after dinner. Before I went to my room, I looked closely at the vintage pictures around the Great Room. Black and white photo’s of Native American Indians of the area, lumber jacks, construction workers, and early park visitors told a visual story about the history. 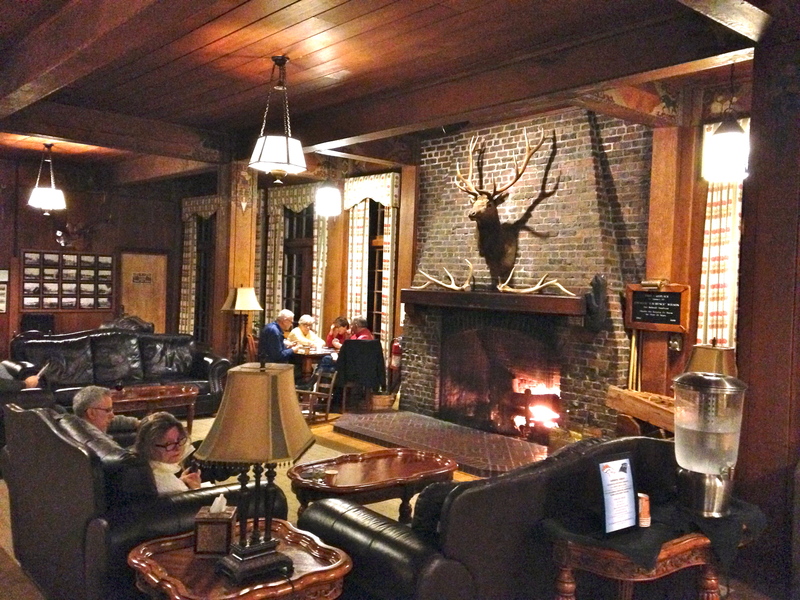 A lodge like Quinault, still so similar to what it was like on the day it opened, makes it possible to feel a very real connection to these people in the photographs without even knowing their names. In this rustic setting, it’s possible to feel their spirit… of adventure, of fishing, boating, hiking, and exploring this beautiful, unique rainforest on the Olympic Peninsula. The next day we fished outside the park on the Wynoochie River – or the “Nootch” as the locals call it. Since it was Super Bowl Sunday there was a lot of activity on the river early but it thinned out by noon and we mostly had the river to ourselves. 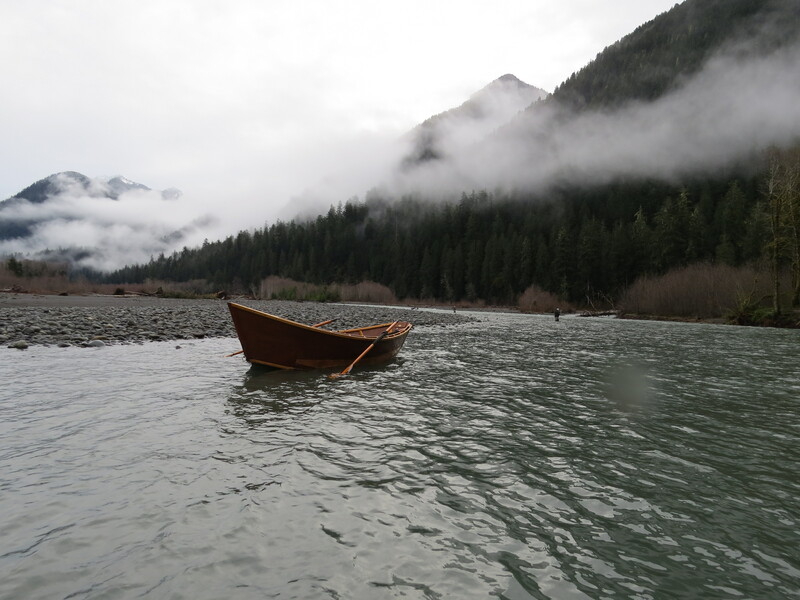 Like the river conditions the day before, downed trees and log jams kept us on our toes and on our oars. 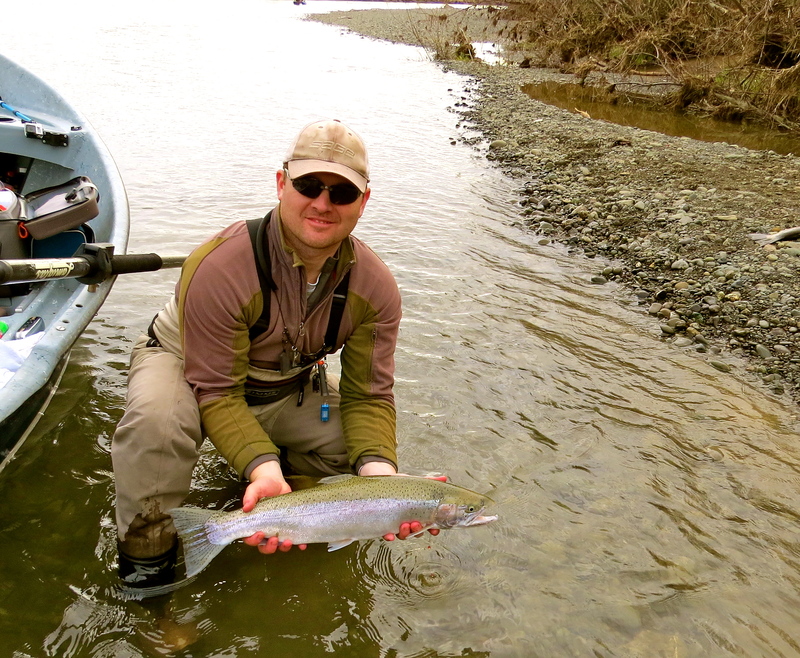 After a slow morning we had an exciting couple of hours of steelhead activity. Rick started it off when he was nymping an egg pattern right below a riffle. Suddenly his indicator went down and didn’t come back. He set the hook strong and could immediately tell it was a heavy fish. 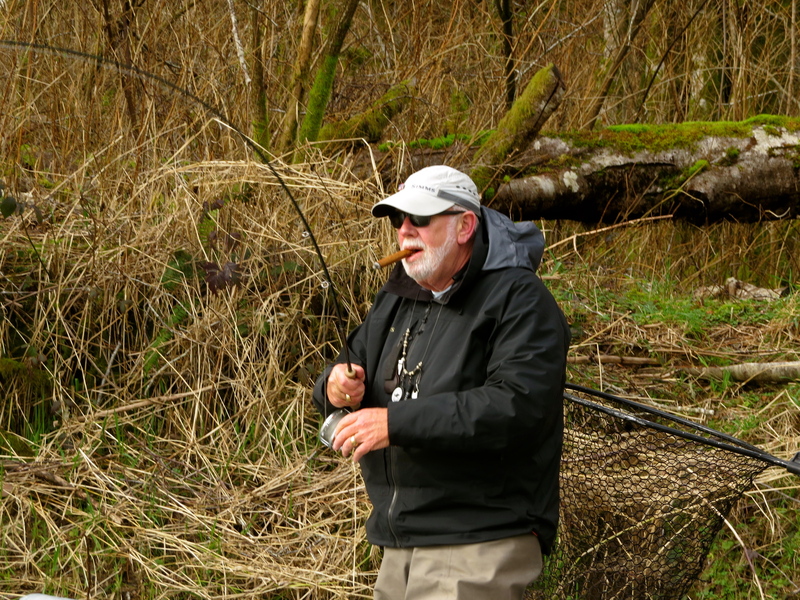 With a solid hook-set, the fish bolted straight downriver taking most of the line and backing in Rick’s reel. After 4 or 5 good strong runs, Rick was finally able to get him close enough to the boat and turn his head for Rich to slip the net under him. 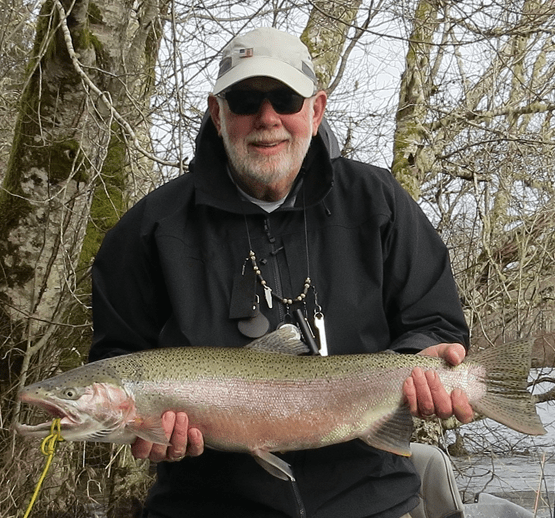 It was in the neighborhood of twenty pounds – one of the largest steelhead we had ever taken out of these waters. We continued to fish and while I had one on and lost it, Rich caught a couple more to add to a memorable day on the river. Olympic National Park had been on my list of parks to visit for a long time and it completely exceeded my expectations. Spending a couple of days on the river with great friends was a bonus and before we went our separate ways we bounced a few ideas around for future trips. What I didn’t expect to find on this trip to Olympic was the memory of Warren Moran. Perhaps it was the high number of “strainers” we had to thread our way around or maybe it was the whiskey we had at night in the lodge. Whatever triggered it, I was glad and melancholy at the same time remembering his big Texas smile and warm greeting on the river and at Trout Unlimited meetings. His memory reminded me to be cautious and skillful when rowing around strainers and to really appreciate the friends I was with on the river… and I’m pretty sure he would’ve had a good laugh at my expense on sleeping indoors. Thanks for the memories of the wonderful Forks, WA rivers. Many stormy, many nice days on the Hoh, Sol Duc, and Quilly. I am inspired to drive back with my woodie next year. Hope to see you in Vida April 23.